According to Notre Dame Professor Patrick J. Deneen's book, reviewed by The American Conservative, Liberalism failed because it succeeded. Notre Dame professor Patrick Deneen has written a book vitally important for understanding the present crisis in Western politics. If this work had appeared two or three years ago, it still would have been of great significance, but coming as it does in the wake of Brexit, Trump, and other shocks to the liberal consensus, its relevance is further enhanced. 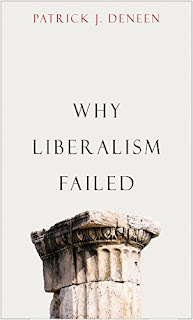 But a warning is in order: American conservatives may be cheered by the appearance of a book entitled “Why Liberalism Failed.” But, in the sense in which Deneen is using “liberalism,” most American conservatives are actually liberals. Deneen’s use is in fact the one common among political theorists, many of whom argue that America does not have a conservative and a liberal party. Rather, it has a right-liberal party, focused on free markets and free trade, and a left-liberal party, focused on social issues. The United States, according to this view, has never had a “church and throne” conservative party such as those seen in many European countries. With their acknowledgement that Conservatives are actually Liberals, The American Conservative writer sounds as though he's been reading James Kalb's indispensable Tyranny of Liberalism. Or this blog. On paper, Liberalism claims there are no wrong answers. But it falls prey to the same error as all other utopian ideologies. In the real world, letting everyone pursue their personal preferences leads to irreconcilable conflicts of interest. Liberals then must call on the state to resolve the dispute. Sure, the whole process is couched in the Liberal language of "government stepping in to preserve the victim's civil rights." But simply using the word "victim"--or if you like, "oppressor", "marginalized group", "bigot", etc. gives the lie to Liberalism by showing that, in practice, some answers are more equal than others. The two liberal parties in America compete by pointing to two seemingly opposed but factually reinforcing trends. The right-liberal Republicans warn against the dominance of society by the state, while the left-liberal Democrats point to the tyranny of the market as the greatest threat to human freedom. Thus each party inspires its partisan members by fear of the threat the other party represents. But despite appearances, both parties, in fact, jointly work to expand both the state and the market. For those of you still scratching your heads over the omnibus bill debacle, Deneen has explained why Republicans never seem to accomplish anything no matter how large their majorities. They're not betraying Classical Liberal principles. Classical Liberalism is inherently unprincipled, and both factions of the monolithic ruling party are following its cynical, opportunistic program to a T.
Here we come to the definitive failing of right-Liberals and the Classical Liberal offshoot of Libertarianism. The theory that individualism and statism are diametrically opposed is proven false in practice, and the claim that the former can serve as an antidote to the latter is demonstrably absurd. A loose mass of rootless, atomized individuals is no match for a centralized authority. Our rulers are well aware of this reality and have successfully used it to quell opposition. Don't believe me? Look at how the dissident movement opposed to globalism, which scored impressive victories with Brexit and Trump's election, has splintered into a babel of squabbling factions. This glaring example of Conservative epistemic closure brought to you by cognitive dissonance. There is no argument in the above paragraph, just empty rhetoric and weasel words like "reactionary", "fantasist", and '"golden age"'--complete with scare quotes. Note that neither Deneen nor his reviewer bother to name any achievements of Liberalism. That's because other than the material wealth, increased longevity, and relative safety--highly debatable if you live, say, in London--that they already dispensed with, Liberalism's main achievements have been to expand state power to a previously unimaginable extent. This growth also coincided with the bloodiest century in world history, though that may not be a coincidence. Deneen and The American Conservative have it backwards. There is no going forward, because as they themselves pointed out, "forward" to what? Matter decays, entropy wins, and the only progress man is capable of making in the end is spiritual progress--a concept anathema to Liberalism. Western civilization is falling into a dark age, and if you're falling in the dark, you want to fall backward because at least you know what's behind you. You can't build on sand. Returning to a preliberal age is precisely what must be done if the West is to endure. We all have to go back. All the way back. 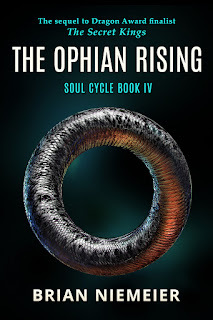 NB: One cool thing about reactionary fantasists is we write pretty awesome fantasy. So do we need tp repudiate liberalism or find what's good and the structure it with Christanity once again? Or do we rearticulate solidarity,subsidarity and complementary like Edward Feser wrote to counter the French Revolution values? In any case, i still struggle and worry about what constitutes the good society? Liberalism is a Christian heresy, so what's good in it is simply what it retains from Christianity. Thus, Feser looks to be on the right track. Have you read either of the books mentioned in this post? I have their samples on my kindle butI’ve yet to get to them. If you have, what is your take? I’m looking for books that talk about Liberalism/Enlightenment/Democracies failings. I’ve found a few and I’m always looking for more. I’m tired of the Churchill quote. You've come to the right place. I have indeed read Kalb's Tyranny of Liberalism. It's all you need, really, since Deneen obviously notes the same failings as Kalb but can't muster the internal consistency to reach the conclusions that Kalb makes. If you're looking to gain an intimate understanding of the centuries-long con game run on the West by the heirs of the Enlightenment, The Tyranny of Liberalism lays it out in excruciating detail. Thanks. It’s now next in my book queue.